This is why we get those pedantic scenes of Maester Luwin quizzing Bran about what’s on whose sigil. When it comes to teaching, I hate and love such moments – they’re surface-level touches that, thankfully, reward careful reading of the literal contents of the mise en scene. I love literal engagements with the text – what else is mapping the narrative locations of films but an avowedly literal approach. But I don’t know what to do with these scenes beyond the surface-level. Yes yes there’s the metaphor of butchery and blood on hands and so on and so on – but that’s all on the surface level. It certainly fills in the fictional world, but I don’t know just how much deeper it makes it. 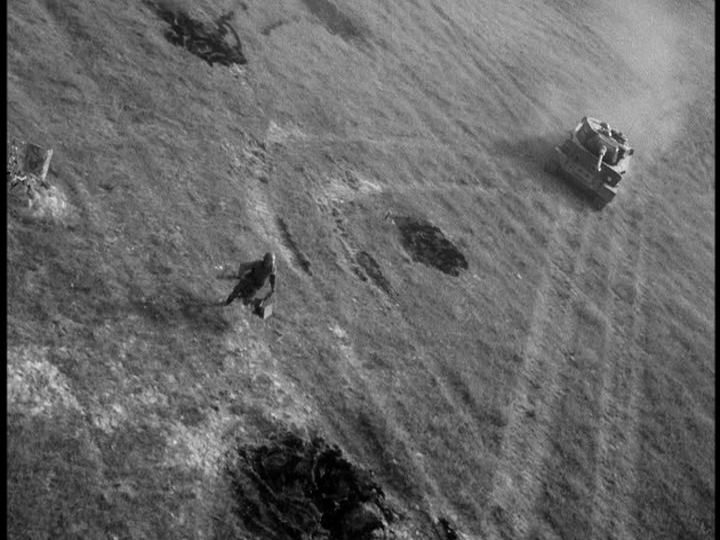 On the other hand, something like Ballad of a Soldier (1959, Grigory Chukhray) throws out images that have somewhat obvious surface-level readings that, on further inspection and contemplation, take us to more interesting places. There’s a wonderful continuous shot of Alyosha getting chased by a tank that does a now-standard flip (Danny Boyle uses a similar shot at the end of Trainspotting when Renton leaves with the money). The obvious disorientation and unsettling of the world emerges from the imagery, but I’d also note the grand absurdity of the scene. A man, on foot, chased by a tank. 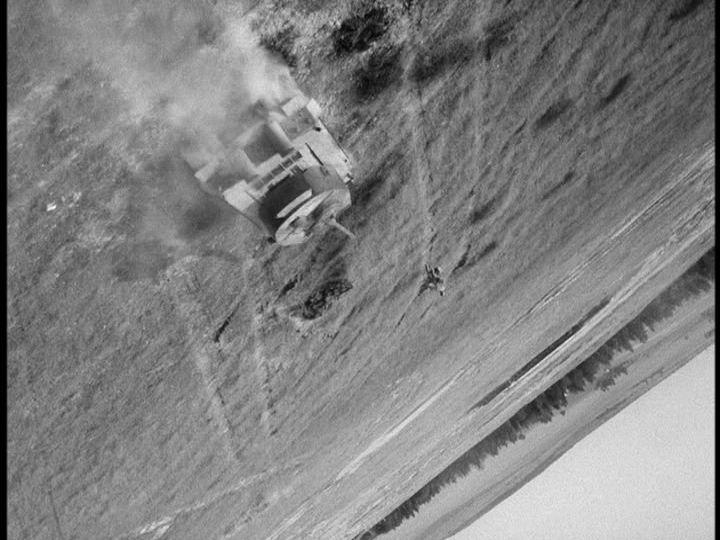 The tracks that criss-cross the field add to the disorientation, but also act to pull our vision away, however briefly, and in the upside-down framing, this creates something like a fog of war. It’s hard to believe that there’s a tank chasing a soldier on foot – and it is that very incongruity that helps Alyosha to escape. Our difficulty in making sense of the situation and the imagery exists within the narrative world as well. It may be that I’m more inclined to prefer Soviet cinema to US television, but this image equals the Game of Thrones bits above in its obviousness, but seems to signify much more. 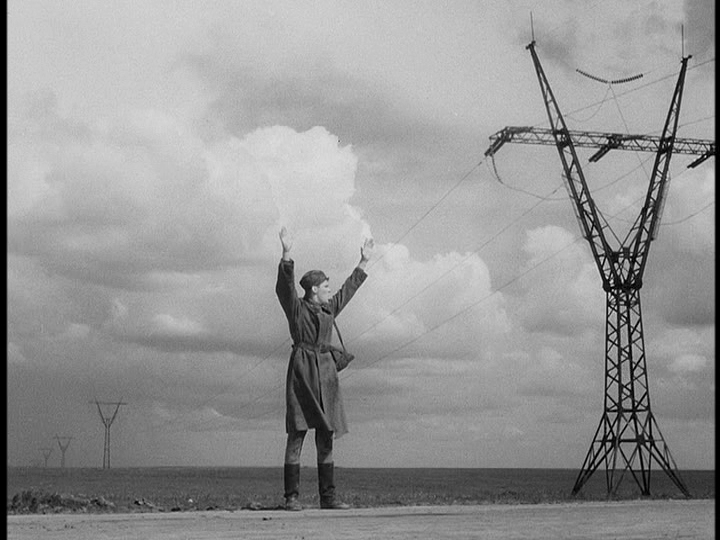 Alyosha echoes the power poles. Sure thing. Then again, Ballad of a Soldier takes place during WWII, The Great Patriotic War. That is to say, Alyosha as a member of the military, paired with rural electrification embodies things that are Great and Patriotic. The great works of physical infrastructure – one of the modernization plans – and the great works of human “infrastructure” (structures, I guess) are in concert, building, connecting, and preserving the Soviet Union. I’m willing to be convinced otherwise – and maybe I’m stacking the deck in my favour by picking an historical example – but to my eyes, this obvious surface-level imagery generates a more complex and interesting reading of the film.